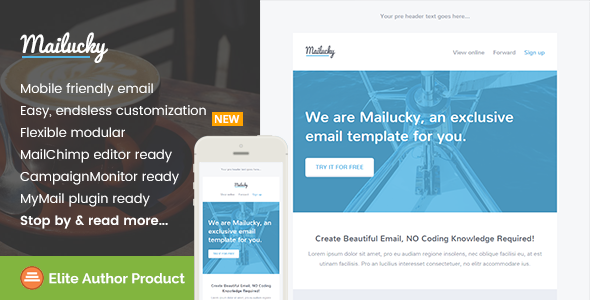 Mailucky is a minimalist, responsive email marketing template for multipurpose use of email marketing campaign. Mailucky comes with flexible modular help you easier to create, mix your own preferred layout. It’s mobile friendly, and major email clients compatible. It’s also packed with bunch of features, free access to our online template builder / editor, MailChimp ready template, Campaign Monitor, MyMail templates are also included. You can arrange the layout and build your own unique template easily. More than that, it’s also packed detailed help documentation, along with video tutorials. NEW! – You can now upload you own imges to replace images / background images. -Add & remove modules, easily with Campaign Monitor editor. Flexible modular that you can very easy to remix them to create your own layout. Fully layered & organized PSD file included. Help Docs – Including video. For support related, please send me your support request / question, or any advice via item support tab. We will respond you usually within 24 hours in Monday – Friday. Some images are not included within the download package. Borrowed from http://www.pixeden.com/ & https://themeforest.net/user/canyigit with their pesmission.